Check the Fien Print: MovieWatch: "The Visitor"
In a Nutshell: I know it's early, but I'm not feelin' the summer of 2008 just yet, at least movie-wise. Looking back at the big blockbusters -- or presumptive blockbusters -- I've seen and reviewed, none have held up particularly well in my mind. It's only been a month, but I don't remember anything from "Iron Man" that I hadn't already seen in the Comic-Con clip reel last summer. I remember plenty from "Speed Racer," but while its visual audacity was occasionally admirable, I remember it more as a over-long sensory overload without any narratively redeeming features. And as for "Indiana Jones and the Quest for Profit," I was caught at exactly the right moment in terms of expectations, where my hopes were just low enough and it was lucky enough not to be worse than I'd feared, but I no longer recall which things I liked exactly, only the CG ants. So that's why it's important to pay heed to the merits of Thomas McCarthy's "The Visitor," even though it's about as tiny and understated a film as you're likely to see this summer. 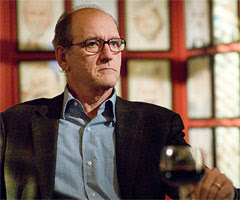 Yes, the movie is limited in scale and emotionally muted, but the impact of the gentle storytelling and Richard Jenkins' performance transcend the special effects that drive everything at your local multiplex. A full review will pop up after the break, assuming I ever finish it. But if this is appearing at all, I've probably made it. There's a pretty simple rule in Hollywood: If you make a well-regarded, moderately successful indie movie that critics describe as "quirky" or "sensitive," your next project has to be a lame romantic comedy starring either Ashley Judd or Kate Hudson as a successful single woman who's been too busy to find a man. Interesting, then, that McCarthy decided to follow "The Station Agent" -- a "quirky" and "sensitive" little short story of a movie -- with "The Visitor," which is in many ways even more unassuming and which is certainly burdened with even less star wattage. McCarthy is a character actor himself, so he appreciates the kindness of a writer or director tailoring a leading role for a performer who would otherwise only get a line or two in a bigger production. McCarthy has had a good year in that respect, having gone from "You know, that guy who was on that episode of that show" to "The dude who was making up the stories on 'The Wire.'" So just as he saw Peter Dinklage as being capable of more than just "Hey look, it's that sarcastic dwarf" roles, he gets infinite credit for knowing that Jenkins could carry the right sort of movie. Jenkins has had an odd career in general. He's probably best known as the deceased father from "Six Feet Under," but he's also gone into broad comedy in a couple Farrelly Brothers movies and, memorably, in David O. Russell's "Flirting With Disaster." On a scale of employability, he probably sees scripts after Bill Murray has rejected them, but before James Rebhorn gets a crack. Does that seem about right? In "The Visitor," he plays an absolutely archetype. Walter Vale the desiccated intellectual who gets shaken from his complacent routine by an outsider. In this case, the outsiders are Tarek (Haaz Sleiman) and Zainab (Danai Jekesai Gurira), to illegal immigrants who end up occupying his uninhabited New York City apartment during his long absence. Jenkins' character is, academically speaking, an expert on immerging third world economies, but he gets a practical lesson courtesy of his new friends, who hail from Syria and Senegal. Things get darker and he learns a lesson in post-9/11 American immigration issues and the new realities of the American Dream and what happens to the huddled masses when she show up in Manhattan just yearning to breathe free. He also has new feelings stirred up by Tarek's mother Mouna (the excellent Hiam Abbass). While those lessons and realities and other thematic undercurrents play out in "The Visitor," McCarthy excels at tiptoeing. Yes, Tarek rekindles Walter's inner spirit by teaching him to play the African drums, even introducing him to a Central Park drum circle, but because of how casually McCarthy and particularly Jenkins play it, you don't get that exploitative feeling that usually comes from movies in which the White Man and the Magical Ethnic Other are played as binary opposites. McCarthy absolutely meanders around the outside of that short of exploitation. This could have been a movie where Walter is a husk of a man, eats a shwarma, pounds a tribal beat on his drum and is suddenly able to stand up to the Evil Dean, impress his students with his newfound hipness and bed his inquisitive young TA. Instead, Walter's disconnect from the world is far greater than that and the movie is a starting point, not a conclusion. McCarthy shies from major character transformations and from major statements, which was part of the pleasure of "The Station Agent" as well. It never became manipulative. As one character finds himself in a detention facility -- McCarthy is, again, interested in how the anonymous correction center blends into the run-down neighborhood -- Walter is given one moment of magnificent catharsis, but no more. Jenkins' performance, which will be too subtle for Oscar voters later this year, but seems perfect for an Independent Spirit Award nomination, is about noticing the little details. "The Visitor" is a softer version of Jim Jarmusch's "Broken Flowers," with Jenkins standing in for Murray and Sleiman giving him a Fela Kuti CD instead of Jeffrey Wright and a Mulatu Astatke mix. If McCarthy avoids charges of exploitation by staying on the outside, Jarmusch has always gone exactly the opposite way, approaching the immigrant experience and the blending of cultures with an anthropologist's eye and a wickedly sardonic sense of humor. If I'm being honest, I prefer the Jarmusch approach, in which language, music and general internationality are things to be marveled at an enjoyed. For Jarmusch, people are all the same in their eccentricities. For McCarthy, our similarities are simpler than that. As was also the case in "The Station Agent," he's still at a point where he finds it interesting that seemingly different people might have core values in common. I guess I'd like for him to dig deeper, but his perspective is simple, sweet and emotionally satisfying, however limited it is. So bottom line: "The Visitor" isn't an antidote for the summer blockbuster, but it's a refreshing sorbet and its flavors may linger long after the frontal assault of the bigger films passes on. Hmmm...maybe I'll give this one another look, 'cause when I saw the trailer, it looked kind of lame and like it would induce that, "...exploitative feeling that usually comes from movies in which the White Man and the Magical Ethnic Other are played as binary opposites." Just to put this review in perspective, you didn't happen to take this one in during your "particularly emo weekend," did you? I have succeeded in largely avoiding summer blockbusters thus far. Indy 4 primarily had the weird effect of whetting my appetite for the sequel to the X-Files movie. Aliens and Ruskies. Bah. I remember the ants, sure, but also the leaden line of Indy 'quipping', "I like Ike." Everything felt...forced. But at least it wasn't a complete travesty.